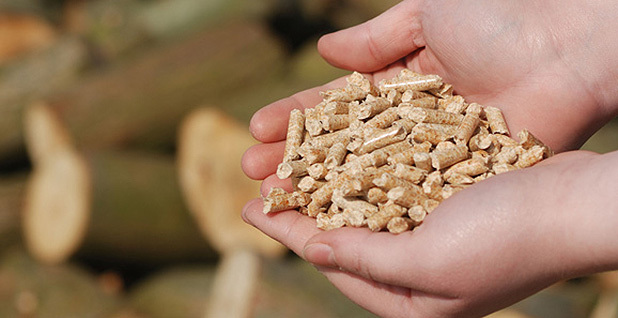 Wood pellets, compressed from pine wood particles, are used in some power plants. Photo courtesy of Georgia Biomass LLC. This story was updated at 4:30 p.m. EDT. The broad fiscal 2017 spending bill released overnight includes contentious language to require the federal government to treat emissions from forest biomass as carbon neutral. It calls on U.S. EPA to work with the departments of Energy and Agriculture to align biomass policies that reflect "the carbon-neutrality of forest bioenergy." Former California Democratic Rep. Henry Waxman criticized the language as an incentive for "dirty energy" that would "disadvantage truly clean renewables like wind and solar." "This provision repeats some of the same mistakes in the Renewable Fuel Standard that has had massive unintended negative consequences for forests, the climate, and consumers," Waxman, now chairman of the advocacy firm Waxman Strategies, said in a statement to E&E News. Environmentalists say the rider ignores carbon dioxide emissions released by power plants that burn wood, and that boosting bioenergy would mean cutting down more trees in the United States and set an example for rainforest nations that could lead to destructive practices. "Biomass is not carbon neutral, and it will never be a solution to climate change, and pretending otherwise is bowing down to the timber industry," said Friends of the Earth Senior Political Strategist Ben Schreiber. "The inclusion of this rider is a significant setback for the integrity of science in climate change research." The biomass industry has been working on multiple fronts to push language through Congress supporting the carbon neutrality of bioenergy. The broad energy reform bill that died last Congress, S. 2012, included a bipartisan amendment with similar language to that in the new spending bill. Biomass boosters had tried to include such a rider in previous appropriations measures without success (E&E Daily, June 16, 2016). Advocates for paper and wood product manufacturers say most of their power comes from burning sawdust and other residual manufacturing materials, thereby avoiding CO2 emissions. "Our member facilities use every part of the raw materials in the manufacture of wood products and to generate the energy needed to do so," said American Wood Council President and CEO Robert Glowinski. He estimated 75 percent of the energy from AWC member facilities is generated from carbon-neutral biomass and called the rider a "step in the right direction." Today they thanked Republican Sens. Susan Collins of Maine and Lisa Murkowski of Alaska, chairwoman of the Senate Energy and Natural Resources Committee, for their leadership. The American Forest and Paper Association has been working to address "regulatory uncertainty" on biomass for seven years, said President and CEO Donna Harman. "We are encouraged that Congress appears ready to provide direction to the administration to ensure there are clear and consistent policies on biomass," Harman stated, urging swift action. "If the biomass carbon language is enacted, we look forward to working with the Trump Administration to develop clear and simple policies that recognize the many economic and environmental benefits of biomass energy," said Biomass Power Association Executive Director Carrie Annand in a statement to E&E News. The omnibus also reflects lawmakers' continuing preoccupation with potential compliance challenges posed by EPA's 70-parts-per-billion ground-level ozone standard, adopted in 2015. Significant parts of the country still don't meet the previous 75 ppb standard from 2008. Explanatory language associated with the fiscal 2017 spending bill requires the administration to give states "some flexibility" to meet these potentially overlapping standards. EPA would have to report back to Congress within 90 days on the potential for administrative options "to enable states to enter into cooperative agreements with the agency that provide regulatory relief and meaningfully clean up the air." The language appears to resemble an approach pushed by Sen. Orrin Hatch (R-Utah) that would resurrect a program to let regional and local governments forge "compacts" with EPA to avoid nonattainment designations, which can entail stricter permitting requirements and other restrictions. The George W. Bush administration ran the compact program from 2002 to 2007 but eventually scrapped it in the face of legal challenges from environmental groups, Hatch's office has said. In the 114th Congress, Hatch introduced S. 2072 to revive the program. Despite a hearing by a Senate Environment and Public Works subcommittee last June, the bill never advanced. A Hatch spokesman did not reply to phone and email messages this morning asking whether the senator was responsible for inserting the report language in the new omnibus spending bill, which avoided many of the most controversial energy and environment riders (E&E Daily, May 1). In their summary of the legislation, Democrats said it would not prohibit EPA from using Section 115 of the Clean Air Act, bar use of the social cost of carbon in rulemaking or withhold funds for EPA to promulgate rules on hydrofluorocarbons, the potent climate-warming chemicals used in refrigeration and air conditioning. Trump has used executive action to take aim at climate-friendly policy tools. Congress also got involved through the Congressional Review Act, eliminating some of the most contentious Obama-era environmental rules.